Compared to last month it doesn’t seem like Rosalie has developed many new skills, it is more that she has been getting a little bit better at those skills that emerged in month 10. For example, she can reach quite a pace with her crawling now and she takes great delight in crawling away at inopportune moments. We can have a good game of chase and hide and seek now too! Last month she started pulling herself to standing and now she does this with much more confidence and purpose. Scarily she has started trying to climb too. She hasn’t begun cruising, but will take a few steps and a stretch to reach something she wants. She does like it when we hold her hands and help her take steps that way, but seems to get tired easily. She’ll get there, there’s no rush. She is making a few different sounds now – I think we can make out ‘done’ which she repeats when she’s finished eating, and also ‘num num’, but I’m not sure if this is associated with anything in particular. We have been going to Jolly Babies since she was around 3.5 months old; at that time she would enjoy the music and I would move her arms to do the actions, but now she has really come into her own. She recognises the music and starts waving at the hello song, and also joins in with the clapping (we clap after each song), and when the instruments come out she goes wild and dives into the box choosing shakers and bells! It’s brilliant! Last month she learnt to stack her nesting cups inside one another; this month she has learnt to stack them up into a tower. 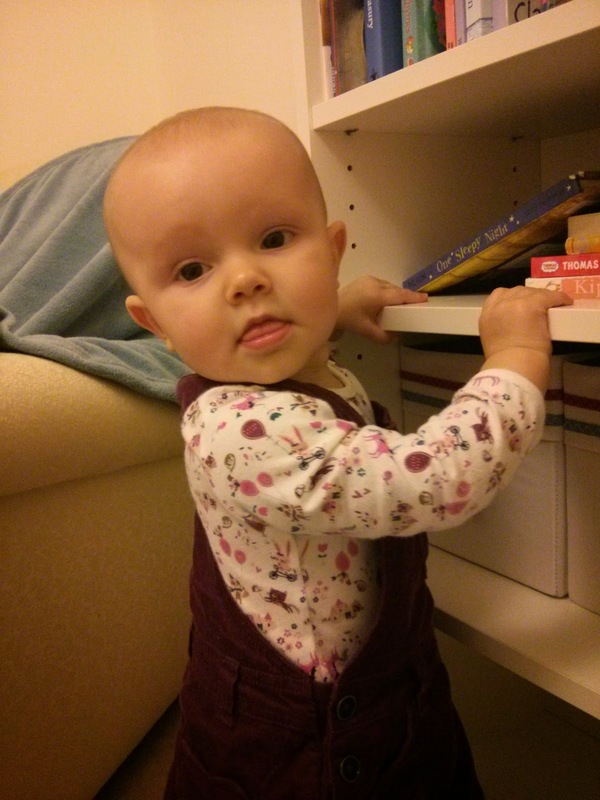 Rosalie at about 45 weeks old, pulling herself up to reach her library books, my little bookworm! I love writing these updates and am so glad I started doing it as it’s going to be fascinating reading back through them as she grows up. It’s funny how easily you forget the tiny developments that seem so significant at the time.